Matthew Herbert Sets The EU To Music With His Brexit Big Band The British musician is on a tour of Europe, apologizing for Brexit, the plan by Britain's government to leave the EU. The last performance is scheduled for the same day leaders are gathering to finalize a potential Brexit deal. 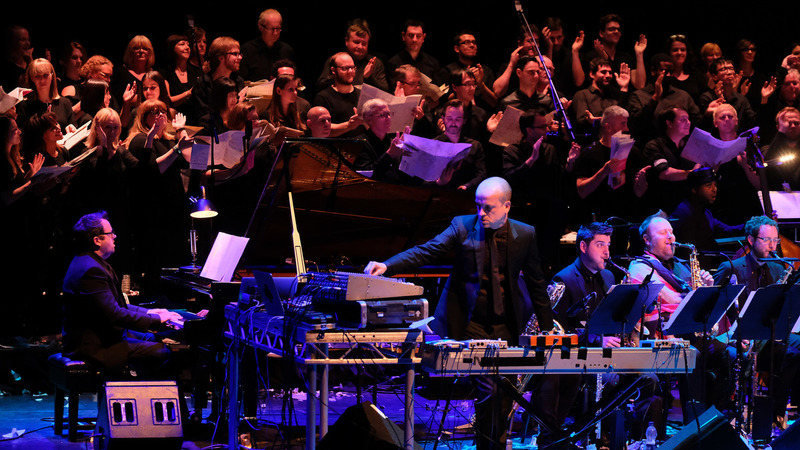 The Matthew Herbert Brexit Big Band, with the London Brexit Choir, performing at the Barbican Centre in 2017. 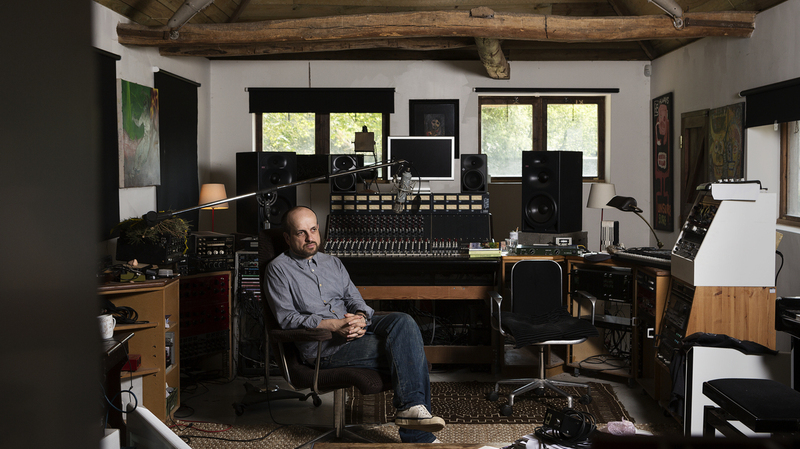 British musician Matthew Herbert is best known as an electronic artist, who goes by various aliases, including Dr. Rockit and Radio Boy. Right now though, he's in the midst of a two-year "apology tour" across Europe with his Brexit Big Band, Herbert's musical response to the British government's plan to leave the European Union. The tour, an ongoing artistic process, will culminate in an album to be released in March 2019, on the day the U.K. is supposed to leave the EU. The Brexit Big Band has played five concerts so far, and its last performance on Nov. 25 coincides with European leaders gathering to finalize a potential Brexit deal. Herbert started the Brexit Big Band just over a year and a half ago, when the British government triggered Article 50, the get-out clause for any EU member state wishing to leave the union. So Herbert set Article 50 to music. "I was like, 'Wait, I don't actually know what Article 50 is,' and I read it and actually it's quite simple," Herbert says. "It's quite sad. It's about the breakup of a relationship, really. It's a little like a no fault divorce, so there's a sort of tenderness to it." For the Brexit Big Band Tour, Herbert is working with a different set of local musicians in each European city. He intends to show that just because Britain's political leaders have given up on Europe, it doesn't mean all of Britain has. "I wanted to stand up for the values that I think are under attack, which are the values of tolerance and compassion and kindness," he says. "I want to defend those values vigorously." Although Herbert is best known for his electronic work, the musician has been splitting his time for more than a decade between composing alone on his laptop and working with a big band. Herbert sees a strong parallel between the way a big band works as a large ensemble that both collaborates and improvises, and the way the European Union works as a collective of independent states. Matthew Herbert believes that a big band is the ideal ensemble to give a musical voice to the idea of the EU. Herbert's surprised there has been so little artistic reaction to Brexit from fellow musicians. "At a time of great political shifts, I feel like as musicians we should be trying harder to present meaningful critiques," he says. "It's hard to imagine that the musicians of the '80s would have taken it lying down in a way that the British music industry is at the moment." Herbert laments that the soundtrack to Brexit, so far, has been an onslaught of insults on talk shows and squabbling in Parliament. In addition to trying to drown out the jeers and political fracas of Westminster, at his concerts Herbert asks the audience to rip up copies of The Daily Mail, a pro-Brexit tabloid, which he then samples electronically. The ensemble also plays "You're Welcome Here," a song written for the EU migrants who have become targets for the pro-Brexit camp. The Brexit Big Band is currently working on the March 2019 album while touring. Herbert's hoping to record what may well be a rowdy chorus of voices. "So we're setting up a choral session for members of the British government to come and join in, and we'll see how many of the [Vote] Leave campaigners actually turn up to do it," Herbert says. Herbert has scheduled the final concert of his Brexit Big Band tour for the city of Rome, where just over 60 years ago, the European Union's founding treaty was signed. "It feels a good place to finish somehow," Herbert says.